We’ve reviewed a few beautiful Peruvian handcrafted items from Inca Kids before, and our recent fair trade Christmas items do not disappoint! Inca Kids is company committed to supporting Peruvian women working from home to support their children making crafts with traditional techniques and natural materials. Their prices are affordable, and it is a win-win situation for everyone involved. Consumers get high quality fair trade items, and artisans are supported. Inca Kids,a self-funded project member of the Fair Trade Federation, works directly with skilled yet unprivileged artisans in Peru to offer unique Peruvian art created with natural materials and traditional techniques. We are committed to provide fair wages, a sustainable workplace, equal opportunities for men and women and to support community building initiatives that foster awareness of the fair trade movement and hope to provide poverty relief and education. 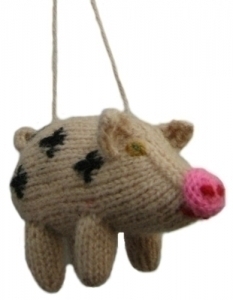 Both of these handmade ornaments are delightful, and I am especially enamored with the pig. Inca Kids is focusing on hand knitted ornaments this year, so that parents don’t have to worry about young children being poked, chocking, or breaking ornaments while decorating the tree. These fair trade ornaments are only $5.00! This festive, colorful stocking immediately started a scuffle in our home over who would get to use it. We settled it fairly (it is fair trade) and decided it would be the puppy’s. This stocking is on sale for only $12! What great cyber deal! Would I buy these products? Yes! I think Inca Kids is a company that deserves our support, and their products are affordable and beautiful. These are holiday decorations you can feel good about, as you are supporting mothers in Peru, and will last for generations. Right now Inca Kids is offering free shipping on all orders over $25, and they have a great sale and clearance too! I love cookies! Cookies create a nostalgic feeling for my grandmother, besides they are so delicious. It makes me feel like a good mom when I bake cookies. I feel so domesticated. 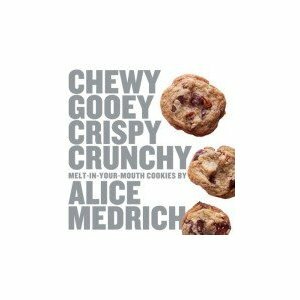 Chewy Gooey Crispy Crunchy Melt-in-Your-Mouth Cookies by Alice Medrich is a fat cookbook full of cookie recipes. Actually, it is more of a resource book than a cookbook, as every possible cookie you could dream up is featured in this aesthetically pleasing cookbook. There are even wheat-free recipes, and every one is made from all natural ingredients (I would advocate using organically-grown though). Would I buy this cookbook? Probably. I am in a frugal mood, and I know that I have plenty of cookbooks. Do I really need a cookbook devoted entirely to just cookies? These recipes look so delicious, that I would probably answer yes. Besides, it is on sale for $16.47! There are so many baby carriers on the market now. I had never heard of the Kokopax until recently. This carrier has lots of padding. The Eco Classic offers 100% cotton fabric colored with eco-friendly dyes. The eco-classic carrier is the premium carrier in the kokopax line. It incorporates the latest technology in green textile printing and consumer safety. Fashion fabric on the eco-classic carrier is comfortable and safe for little ones. The carrier weighs approximately 3 pounds and features a five-point harness, adjustable shoulder straps, sturdy kickstand, pocket with magnetic closure and a padded waist belt for added comfort. It’s a whole new way to keep baby happy and your hands free as you breeze through daily life. 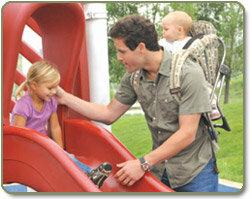 Designed for children ages six months to two-years-old (maximum weight 35 pounds), this is a cute, easy to use carrier. So many carriers are confusing the first time you use them, but this one is straight forward. The kickstand is very convenient for loading and unloading your child by yourself. Would I buy this product? No. $180 seems like too much money for me, and if the Kokopax wanted to be truly eco-friendly, it would upgrade to organic cotton fabric. I also wonder what the padding is stuffed with, as I imagine it is a petroleum-based polyester batting. The Kokopax reminds me of a cross between a soft fabric carrier, like the Ergo Organic Baby Carrier($110) and a backpacking framed carrier, like the Kelty K.I.D.S. FC 3.0 Frame Child Carrier($163). Both are cheaper than the Kokopax, and if you are looking for a frame carrier, Kelty offers a sun/shade hood, holds children up to 50 pounds, can hold up on many long expeditions (including weather elements), and offers additional pockets for carrying diapers,etc. If I Could Keep You Little… is a sweet book any parent and child can relate too. Some parents try to hold onto their young children, and some young children hang on to being the baby. Regardless, time progresses and we all grow. 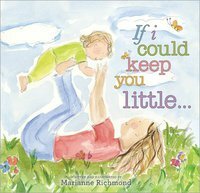 Written and illustrated by Marianne Richmond, each page of this book starts off with a cherished toddler moment and how it develops into an equally cherished moment in an older child’s life. If I could keep you little, I’d pick for you a friend or two. But then I’d miss you finding friends who like you, too! If I could keep you little, we’d finger-paint our art. But then I’d miss you creating stories from your heart. Would I buy this book? Probably not. After participating in the second Green Books Campaign, I’ve committed to only buying paper books that use recycled or eco-friendly paper (or ebooks). Although this story and its illustrations are charming, there’s not much about it that qualifies as green. This book is only $10.87, which is a great deal for a hardback book! 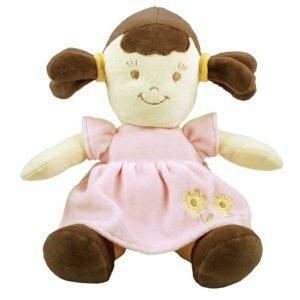 Super soft and cuddly, this organic doll is sure to delight any child. These precious dolls are made with certified organic cotton fibers making them ultra soft and safer for children by reducing their exposure to harmful pesticides and chemicals. This organic cotton growing process also means that there was no pollution done to the water, air or soil, another step towards a brighter future for kids and the planet. Instead of petroleum-based poly-fill, this organic doll is stuffed with corn fibers. It is machine washable, which is an added bonus, as any busy parent can attest. You can choose either blonde or brunette for your doll. This doll has won Dr. Toy awards. Another added bonus to this organic doll is a “portion of proceeds” is donated to a childhood cancer organization. Would I buy this product? Maybe. I’m on the fence on this one. It is super soft and adorable, but $24.99 seems a little bit pricey for it’s size (12 inches). Then again, comparable organic dolls are more expensive, such as a Waldorf style doll, so it’s probably just my frugal holiday mood that is making it hard for me to commit. « Is Organic Milk a Hoax?